The VIIth EULAR Postgraduate Course in Rheumatology took place in Budapest from the 22nd to the 27th September 2002. The programme was designed to offer a comprehensive review and discussion of the scientific basis and clinical practice in the diagnosis and management of a large spectrum of rheumatic conditions, with an interactive approach. The level of knowledge was targeted at the rheumatology trainee from the final years of training. The faculty included over 30 highly recognised scientists and clinicians from all over Europe and North America. The audience was composed of 96 physicians (mostly rheumatology trainees, n=51) and scientists from Western Europe (n=50), Eastern Europe (n=35), Africa (n=5), the Far East (n=4), and the Near and Middle East (n=2). Despite the intensive working programme both the audience and the faculty managed to maintain a lively and informal ambience, which contributed greatly to the educational level achieved. Social interaction between doctors of different countries and also between young rheumatologists and established experts was one of the most important targets of the course. Most members of the faculty expressed great satisfaction in taking part in the course. 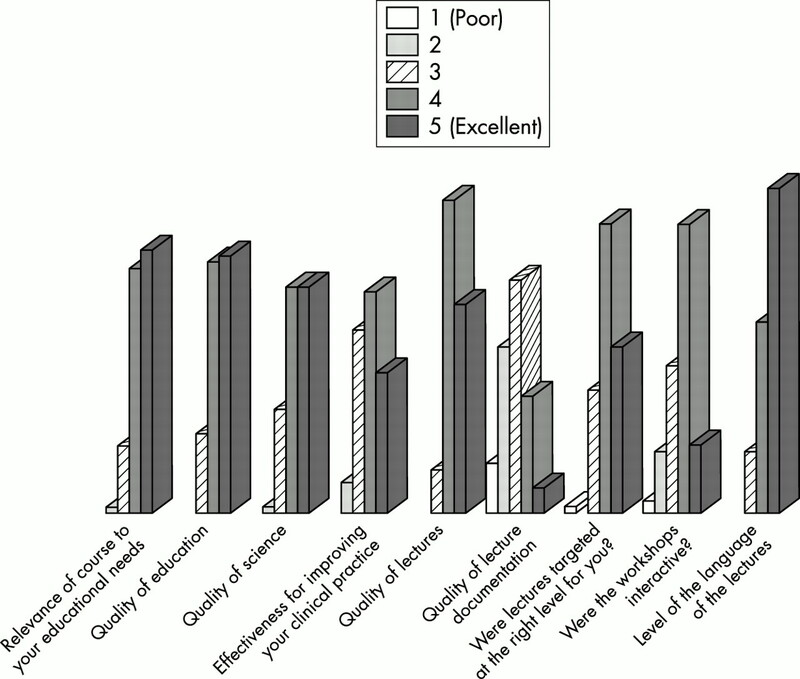 The evaluation by attendees of the organisational (fig 1) and the scientific aspects (fig 2) of the course was highly satisfactory to the organisers. EULAR feels highly rewarded with these results and will continue to make every effort to improve their educational value in the future. Evaluation of the organisational aspects of the course. Evaluation of the scientific aspects of the course.